I am pleased to announce the upcoming Community Performance of Spearman's UIL One Act Play Entry for 2018- GLORIA MUNDI by Patricia Brown. 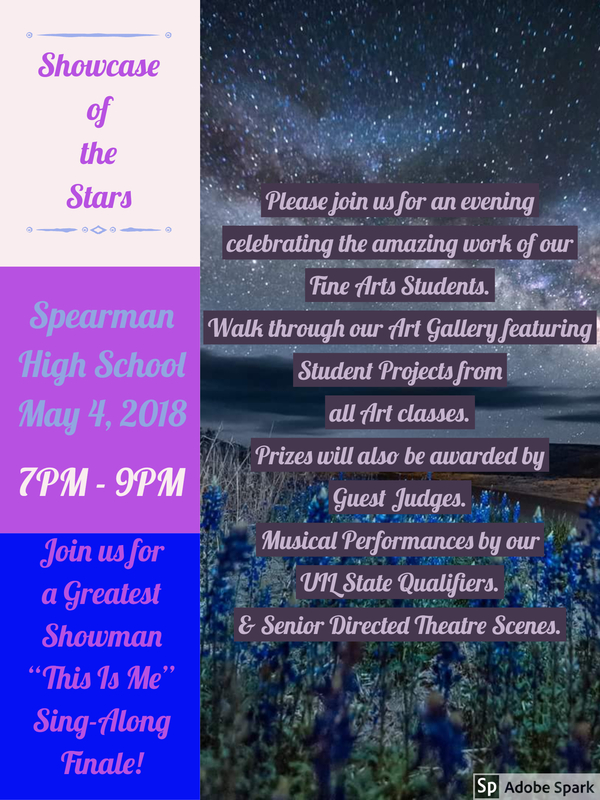 By special arrangement with Samuel French, Inc. publishing house- we are having a "free" performance Thursday, March 8th at Spearman High Auditorium Doors open at 7 pm; while it is a "free" performance we are accepting donations to benefit Senior Scholarships for our Theatre Students. Our story takes place in the waiting room of a unique Asylum in 1927, when sadly any person not fitting the "norms" of society could have easily have been committed for the slightest tick, fidget and socially unacceptable habit. Here a young and naive Miss Virginia Blake is about to embark on her first day as the new Nurse, hoping to help others and "touch life". As the story unfolds both Virginia and the audience learn that not all she meets are as they seem; that the shocking realities of life can certainly test the sanity of even the best of us. Finally, Virginia is faced with a tough decision and she sees for herself that there is sometimes a very fine line between finding your purpose and accepting your fate, that strength and hope are as strong as any of the tools in her medical kit. As this is my first year Teaching and Directing at Spearman High School, I wanted to find a play that was built for an ensemble rather than built around any specific "lead" actors. I want each Performer to have an opportunity to shine onstage. This year we have a few students familiar with OAP and even more who are taking the stage for the very first time. I also wanted to produce a show that had equal opportunity for our "backstage" talent to show their talents- and GLORIA MUNDI is ripe with technical effects that are executed by an incredibly talented Tech Crew. I am incredibly proud of the hard work they have put in to be ready for competition in Tulia as they compete in the District 1 3A Bi-District competition Wednesday, March 7th. Congratulations to Yesenia Briseno for being selected to the Honorable Mention All Star cast at District OAP. Congratulations to Keanan DeLaRosa and Patrick Ruga for receiving the Technical Sound award at District OAP!